Summit Gutter Systems is the top provider of rain gutter covers across metro Denver and Summit County. Our company offers a wide range of services to homeowners and commercial clients. We are happy to help you take care of your gutters and improve the drainage system of your home. In addition to rain gutter covers and other accessories, we also offer additional services such as gutter maintenance, repairs and new installations. With over two decades of experience, you can depend on our team to show expertise and professionalism at all times. Rain gutter covers make it easier to maintain your gutter's function and reduce the need for regular cleaning. For buildings surrounded by trees, this is particularly important. The leaves, flowers and other organic material that falls from trees and onto your roof will get washed into your gutters. When enough of this matter builds up it will slow the flow of water and eventually cause blockages and overflowing gutters. The affordable and simple solution to this common problem is a custom fit rain gutter cover. The mesh will prevent material other than water from entering your gutter system. Call us now to get a quote on gutter covers for your home. Summit Gutter Systems offers rain gutter cleaning service to homeowners across metro Denver and Summit County. If you are tired of cleaning your own gutters, we can provide an affordable alternative. Cleaning your own gutters can be tedious and risky, if you don't have the right equipment. Older homeowners are particularly prone to risk of injury when carrying out home maintenance on their roof and gutters. Senior citizens can avail of great discounts on top of our affordable rates. We are licensed and insured to carry out rain gutter cleaning services across all the municipalities of Denver. You can trust our experts to provide great customer service on each and every job we carry out. We also provide methods for you to eliminate rain gutter cleaning services altogether. Consider installing a protective gutter guard and you will have a lot less maintenance to worry about. A gutter cover or guard is a simple device composing of a fitted mesh which covers the top of your gutter. This mesh allows water to enter the gutter and drain away but it prevents leaves and other debris from entering and causing a blockage. Call us today for more info on this product or our regular rain gutter cleaning service. Many homeowners are under the impression that new rain gutters cost an exorbitant amount of money. Summit Gutter Systems can carry out a complete gutter system installation at a very affordable price. Our locally owned and operated business has been providing repair work, maintenance and installation services to homeowners and commercial clients for over a decade now. You can get new rain gutters at a cost you can afford. Our team offers online saving coupons every month so that you can get even better prices on our services. This month's special offer applies to senior citizens only and can save you up to $250 on a gutter guard system. We know that many homeowners do not want to clean their own gutters and that some physically cannot carry out the strenuous task. Relying on us for regular gutter cleaning services means that you can extend the life of your gutter system. The cost of new rain gutters will be much more than the cost of keeping your current gutters well maintained and in good working order. If you do decide to invest in new gutters, you can choose from a wide range of materials and styles. Call us to get an estimate on the cost of new rain gutters today. New rain gutters can give your home the protection it needs and prevent water damage, dampness and mold. Summit Gutter Systems can offer a comprehensive gutter contractor service to homeowners across metro Denver and Summit County. Take advantage of the improving weather to make any repairs or home improvements. Many people wait until the absolute last moment to replace their failing gutters with new rain gutters. Unfortunately, this often means that water damage has already occurred. In addition to requiring extensive gutter repairs or complete replacements, they will also need costly repair work done on their attic or the structure and foundations of their house. To save your time and money, it is best to closely monitor your gutters and to schedule regular maintenance checks. If you see your gutters overflowing, leaking, buckling or coming away from the wall, do not hesitate to call us. our team of gutter experts can make emergency call out services to evaluate the situation and minimize damage. If you do require new rain gutters, we can offer a wide range of choices, all made from high quality materials. For the best prices and a 100% customer satisfaction guarantee, you can depend on Summit Gutter Systems for your new rain gutters. 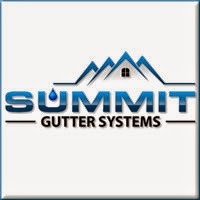 Summit Gutter Systems can offer homeowners affordable prices on a full range of services, including local gutter cleaning in the areas of metro Denver and Summit County. If you haven't been able to clean your own gutters in the last few months, you are not alone. Many homeowners either don't have time, or don't have the equipment needed, or the ability to get up on a ladder and do the manual work involved. For this reason, we offer a professional local gutter cleaning service. You can get your roof and gutter cleared of debris for a good price and without any hassle when you choose our team for the job. A thorough local gutter cleaning will set you up for good drainage and reduce the probability of gutter overflows and water damage to your home's structure. When debris from surrounding trees falls on your roof, it eventually gets washed into your gutters. There, it can build up enough to cause a blockage to your downspout. In this case, the water draining from your roof would fill the gutters to the brim, and with no way of draining,would overflow back onto your roof or run down your walls. Avoid this problem and the resulting water damage and mold growth by scheduling regular local gutter cleanings with our company. Get affordable gutter repair services this year from Summit Gutter Systems. The harsh winter weather can take its toll on the structure of your home. Continuous snowfall combined with melt water refreezing in your gutters can create ice dams. When left unchecked, an ice dam can allow sitting water to seep through your roof and cause mold growth and structural damage to your attic support beams and insulation. Our team of gutter professionals can visit your home and carry out a thorough maintenance check. Now is the best time to take advantage of our gutter repair services and ensure your home drainage is fully functional. Depending on the style and material of your gutters, you may experience issues such as corrosion, peeling paint, sagging or buckling at the joints, rusting or leaking. Our gutter contractors are capable of doing high quality gutter repair services on all styles and brands of gutters. When you choose our company, you are selecting professionalism and excellent value for money. We have over a decade of experience in the gutter industry, and our gutter repair services are highly recommended by our previous customers as well as by the Better Business Bureau, Angie's List, Yelp and the Home Adviser Elite Service listing. Custom rain gutters are available for homes and commercial buildings now from Summit Gutter Systems. We offer a full range of different styles and materials. Complement the architecture of any home with new custom rain gutters from a high quality contractor. Choose between galvalume, stainless steel, copper and factory enamel for your gutters. All of the gutters we supply are coated with an anti-corrosive finish and incorporate seamless technology. You can depend on these gutters to be more resistant to harsh weather, require less maintenance and last longer. Our installation crew will go the extra mile to ensure you are fully satisfied with your new product and the service. Your home is in good hands with our gutter experts. We are licensed and insured to operate across metro Denver and the Front Range of Colorado. You can expect our team to be punctual, hardworking and give excellent attention to detail when installing your custom rain gutters. Visit our website to read the testimonies and positive reviews of our previous clients. Protect your home from water damage with high functioning gutters and downspouts that accentuate the character of your home. Custom rain gutters can be yours for an affordable cost today, just call us for more information.